Cedar Fork Stitches: Last Quilt of 2018! Getting this last finish in just under the 2018 wire! my Year of Fabric Quilt! This quilt gets it's name from the fact that the overwhelming majority of these fabrics were purchased randomly from my LQS, Lewistown's Sew Pieceful over the course of it's first year or so in business! I am so thankful to have such a beautiful shop in my local town! The original inspiration for this quilt is this lovely by Natalie @njcrabree on IG. I thought this was a perfect way to showcase all the wonderful fabrics I had acquired, instead of just doting on them stacked on my shelf! And the design is heavy on the HSTs, so of course it seemed a perfect fit! I straight line quilted it, using the seams as my guide. I pieced a delightful backing for it that I love almost as much as the front! I had quite a time deciding on a binding, and had a lot of very helpful input from all my quilty friends on Instagram! You may see the different options here! In the end, after plenty of mulling time, I went with the dark Pearl Bracelets, as it just seemed to bring all the scrappy goodness to a tidy conclusion! My ever stalwart and faithful quilt holder accompanied me into the frigid outdoors for a few photos this morning! 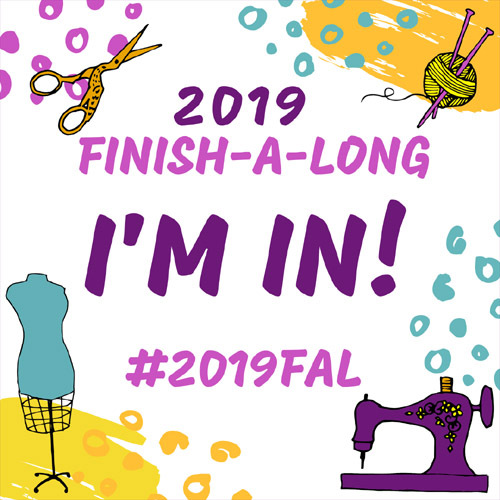 The Year of Fabric quilt measures 72"x72"
Are you ready to link up all your Q4 finishes with the 2018 Finish-A-Long? The linky party is OPEN! I only have 2 finishes this quarter, but 2 is better than none, right?! I hope you will join me and the rest of the Finish-A-Long crew for more fun and finishes in 2019! Q1 opens January 10th, so get your lists ready! Hi Sarah, that's a very lovely quilt! I love quilts made with scraps of loved fabric! I've also included the dates for the 2019 Finish-A-Long on my blog, so I'm hoping that help remind me. Lovely quilt and so many scraps! Congrats on the finish and on behalf of the enitre FAL crew, thanks for participating!